On February 6, the recently established NGO Kosovo for Sandžak and the association “Jakova” held a forum focusing on Hadžiahmetović and the defense of Novi Pazar during World War II in Gjakova, a city in western Kosovo, organized under the supervision of Mayor Mimoza Kusari-Lila. The objective of the forum, which was attended by the family of Hadžiahmetović, was to formally send a request to President of Kosovo Atifete Jahjaga to recognize Hadžiahmetović as an official Hero of Kosovo. The aim of Kosovo for Sandžak, which was established in 2015, is to increase attention and focus within Kosovo on the Sandžak region. The organization, which is led by University of Priština Professor Ismet Azizi, held its first meeting last year, featuring, among others, representatives of the foremost Bošniak institutions and organizations in Serbia under the leadership of Sulejman Ugljanin, president of the Bosniac National Council (BNV), and former presidential candidate Sandžak Mufti Muamer Zukorlić, founder of the Bošniak Cultural Community (BKZ). Aćif Hadžiahmetović, left. (Photo credit: wiki commons)Aćif Hadžiahmetović (1887-1945), a Yugoslav politician of Albanian origin, served as the mayor of Novi Pazar in Serbia’s Sandžak during the Axis occupation of the Kingdom of Yugoslavia. Supporters of Hadžiahmetović celebrate his legacy as a tribute to his defense of Novi Pazar against Chetnik attacks during the war. However, critics of Hadžiahmetović cite his collaboration with Nazi Germany and his responsibility for the expulsion and death of large parts of the city’s Serb, Roma, and Jewish communities during the war, which happened under Hadžiahmetović’s supervision. Critics also claim that he sought to Albanize the Bošniaks of the region, and Hadžiahmetović was indeed a member of the Second League of Prizren, an organization that aimed to unify all ethnic Albanians. Hadžiahmetović, who was later awarded an Iron Cross by Nazi Germany, was executed by Partisan forces at the end of the war for his collaborationism. Although the latest story comes from Kosovo, the true motivation and roots of this debate, just as the history of Hadžiahmetović himself, are in Novi Pazar. In 2006, the BNV began the process for the rehabilitation of Hadžiahmetović at the Novi Pazar Higher Court pursuant to the new law on rehabilitation passed earlier that year in September. However, the case was suspended in November 2012 following the passage of a new law on rehabilitation in 2011. Under the provisions of the new law, the BNV under then-President Esad Džudžo (formerly Džudžević) reinitiated the case for Hadžiahmetović’s rehabilitation with lead lawyer Emir Fetahović the same month. In one of the stranger episodes of the affair, the reopening of the case also includes establishing that Hadžiahmetović is, in fact, dead, which still remains to be settled. The BNV reaffirmed its commitment to the case in 2014. 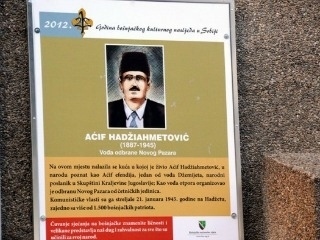 In August 2012, shortly before the case was reinitiated, a memorial plaque dedicated to Hadžiahmetović was unveiled by BNV President Džudžo and Deputy Mayor of Novi Pazar Ahmedin Škrijelj under the direction of the BNV on the building where Hadžiahmetović’s former residence stood in the center of Novi Pazar. Minister without portfolio and President of the Party of Democratic Action of Sandžak (SDA) Ugljanin also attended the event. Mufti Zukorlić too has been a strong proponent of recognizing Hadžiahmetović as a hero, leading a march in 2014 to Hadžet, where Hadžiahmetović among others was executed 70 years ago. However, President of the Social Democratic Party of Serbia (SDP) and Minister of Foreign and Domestic Trade and Communications Rasim Ljajić condemned the dedication as politically divisive. Leaders of local NGOs, including Sandžak Committee for Protection of Human Rights and Freedoms, Urban-In, and Cultural Centre DamaD have also spoken up against the rehabilitation of Hadžiahmetović. The dedication of the plaque has even launched controversy at the national level. The Serbian Ministry of Justice in August 2012 ordered the municipality of Novi Pazar to take the plaque down, with Secretary General of the Serbian Government Veljko Odalović giving a deadline of 30 days for the plaque’s removal. Then-First Deputy Prime Minister of Serbia Aleksandar Vučić also summoned Ugljanin to report back on his attendance and involvement at the event. However, the BNV opposed the order to remove the plaque, stating that national authorities must first remove Chetnik memorials across the country. On a visit to Novi Pazar in April 2015, Serbian Prime Minister Vučić repeated his opinion that the dedication of the plaque was unwise. Subsequently, Ugljanin warned in May of that year that anyone who attempts to remove the plaque would face consequences. As of today, the plaque still remains. Photo credit: Patrick McGrathThe recent meeting of Kosovo for Sandžak in Gjakova, as well as the dedication of the plaque in 2012 and the attempts to rehabilitate Hadžiahmetović in Novi Pazar, highlights the continued search to settle historical accounts in the former Yugoslavia and the contention that has arisen from the rehabilitation of Chetnik figures from World War II, among others. BNV Vice-President Muhedin Fijuljanin openly stated that the decision to pursue the rehabilitation of Hadžiahmetović is in part a response to the recent rehabilitation of Chetnik leader Dragoljub “Draža” Mihailović. Mihailović, who was executed in 1946 for collaborationism with the Axis powers and was responsible for ethnic cleansing (including that of Bošniaks) carried out by Chetnik forces, was officially rehabilitated in 2015 by the Belgrade Higher Court, following a request submitted in 2006 by Mihailović’s grandson and former Mayor of Belgrade Vojislav Mihailović. The wave of rehabilitation attempts in Serbia began shortly after the passage of a new law in 2004 that equalized Chetniks and Partisans in Serbian history and a law on rehabilitation in 2006, which paved the way for rehabilitation requests. An additional law on rehabilitation was passed in 2011, which specified that individuals who were both part of occupying or collaborationist forces and were involved in war crimes are unable to qualify for rehabilitation. Most recently, in 2015, independent MP Borislav Stefanović proposed an amendment to the law on rehabilitation before Parliament to ensure that all individuals who collaborated with occupying forces and fought against anti-fascists would not be rehabilitated, citing Hadžiahmetović as an example. However, the proposal was rejected. Since these new laws were passed, over 2,000 requests concerning rehabilitation have been submitted to Serbian courts. The continuation of these debates emphasizes the ongoing controversy over how historical figures are remembered in Serbia and on what grounds individuals can be considered for rehabilitation. However, these debates also reveal to what degree history has been politicized in Serbia since the fall of Yugoslavia. Mihailović, a figure long-scorned during the time of the Socialist Federal Republic of Yugoslavia, grew in popularity during the wars in the 1990s amid the rise in Chetnik supporters. Further, the laws passed on rehabilitation in the mid-2000s took place under the guidance of the national conservative government of Vojislav Koštunica. Meanwhile, in Sandžak, the rehabilitation of Hadžiahmetović has been embraced by the SDA’s Ugljanin but spurned by the SDP’s Ljajić, both of whose parties have been bitter political rivals (see the 2008 pre-election shooting), with the SDP currently in power in Novi Pazar. Thus, rather than a consensual search for the truth in history, political parties have sought to recast history in a way that provides them with the most political support. As the countless requests for rehabilitation (and national heroes) are eventually processed and old wounds are reopened, it remains to be seen whether national heroes will have truly been served justice or whether the usual political suspects will have simply increased divisiveness among the Serbian public.